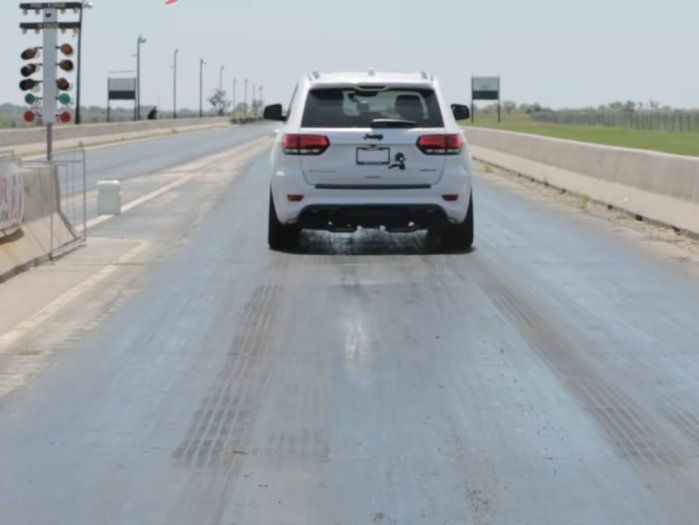 It has been a few months since we talked about the Hennessey high performance packages for the supercharged Jeep Grand Cherokee Trackhawk, but this new video from the Texas-based tuner shows the 1,012-horsepower in action on a drag strip – and the results are impressive, to say the least. Last year, well before the first Jeep Grand Cherokee Trackhawk had been delivered, Hennessey Performance in Texas announced their 1,000 horsepower package for the supercharged Jeep. Like the rest of the shop’s packages, this package is named after the power output, so the pinnacle performance upgrade for the Trackhawk from Hennessey is the HPE1000 – lifting the output from 707 horsepower and 645 lb-ft of torque to 1,012 horsepower and 969 lb-ft of torque. More importantly, this engine upgrade package lifts the output at all four wheels to 823 horsepower and 718 lb-ft of torque. Just how quick does 823 all-wheel horsepower make a 5,500-pound Jeep Grand Cherokee? The video below answers that question in fine fashion, with the modified Mopar SUV dashing from a stop to 60 miles per hour in just 2.7 seconds without the use of the Torque Reserve system. In case you missed our previous discussions about the Hennessey HPE1000 package for the new Jeep Trackhawk, here is a quick rundown. This package begins by removing the stock 2.4-liter IHI supercharger, replacing it with a 4.5-liter unit from Whipple. Other key upgrades include stainless steel long tube headers, larger fuel injectors, a boost-a-pump fuel pump upgrade, a high flow air intake system and an “HPE engine management upgrade” that includes an unlocked PCM and a custom tune to hit those numbers referenced above. Hennessey doesn’t list a price on their website, but their packages generally aren’t cheap, so I would guess that this package costs a bit more than your average tuner shop upgrade – even if the power levels may be lower. With Hennessey, you are paying for the name in addition to the performance, but today, we are focusing on the real world performance measures that are on display in the video below. In the video below, we get to watch as John Hennessey launches the Jeep Grand Cherokee Trackhawk with the HPE1000 package. Based on the sound of the exhaust on launch, it seems as though Hennessey is not using the Launch Control system with Torque Management, so the high performance preload system is not active, but that doesn’t stop the 5,500-pound SUV from screaming down the track. Even when launching from just above idle, with the driver bringing the engine speed high enough to engage the torque convertor, the supercharged SUV scoots from a stop to 60 miles per hour in just 2.7 seconds, stopping the quarter mile timer at 10.7 seconds with a speed of 132 miles per hour. As for not using the Launch Control system with Torque Reserve, I would guess that with the extra power, traction is lost when launching with more boost and more power. For example, while recently testing the stock Trackhawk around my home area, I was able to get 3.1-3.2 0-60 times when using just my feet, but with Launch Control and Torque Reserve, I was “only” able to get a best time of 3.4 seconds on the same test track. The issue was that when launching with the added boost and power, the Jeep would smoke all four tires, effectively slowing it down, while launching near idle with no boost affords far greater traction. Of course, Hennessey could also be worried about breaking something when launching with some boost pressure, but traction is a definite issue when launching with the stock tires.